Quality and satisfaction are at the core of everything we do at Steel Materials. Since opening our doors in 1987, we have been dedicated to our clients, their projects, and being the best at what we do. Still not convinced? We are not just another fab shop, our 40,000 sq ft facility is filled with state of the art equipment, and coupled with a skilled staff, the results are met commitments and repeat customers. 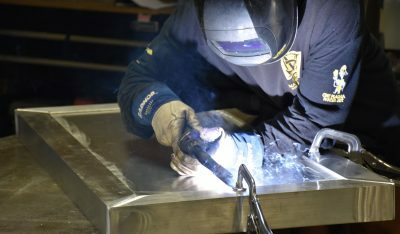 Steel Materials offers custom, and turn key production work. From aiding in design to powder coating, we can help. Have questions or would like a quote for your project?